"Wedding Disco - DJ County Durham"
No matter how great the ceremony was, how pretty the bride and how good the food, a poorly-chosen DJ could possibly ruin the day. Your wedding entertainment will in most cases account for nearly 50% of your day. Good wedding disco entertainment just doesn't happen - it's carefully planned and prepared for in a professional manner just like any other essential part of your big day. We plan and schedule your wedding party celebrations with you to make sure everything runs accordingly on the night when you use our DJ company. You can be assured that with our experience of doing weddings you are in good hands and we are able to offer you professional advice should you require it in case you are unsure of how to go about planning the disco for the day or night. Your wedding should be one of the best days of your life. When hiring party entertainment for your big day it is just as important to hire the right wedding DJ because this will be the last thing to top it all off and will be what your guests remember for a long time. We provide high quality entertainment for weddings and other special occasions as well as corporate functions. Your special day requires attention to detail, so we agree everything with you before your big day, so you don't have to worry about anything. This leaves you to enjoy your wedding day with family and friends. We work hard to ensure everything runs smoothly and help everyone have a good time. Required by many venues, County Durham Wedding DJ has a current PLI policy with National Association of Disc Jockeys in the amount of £10 million. 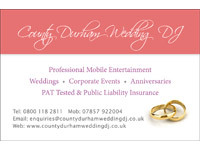 Also required by many venues, County Durham Wedding DJ has supplied satisfactory evidence of holding current PAT inspections of their equipment dated within the last 12 months. A Method Statement, outlining County Durham Wedding DJ&apos;s Health & Safety procedure for setting up disco equipment has not been supplied. 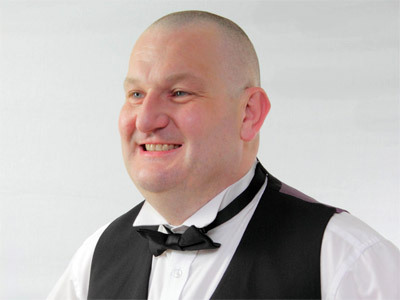 Why do people choose to book County Durham Wedding DJ? "Absolutely fantastic service. Would recommend to Anyone"
County Durham Wedding DJ also offers a range of additional party services not directly linked to musical entertainment. Get FREE no-obligation disco quotes from County Durham Wedding DJ and other DJs covering your venue. Take 2 minutes to fill in some basic details and we'll do the rest! If you are contacting County Durham Wedding DJ about an event, it's always a good idea to include the DATE, LOCATION, EVENT TYPE, AGE GROUP and TIMINGS to speed things up!